Over the weekend, my co-worker and I discussed how the air has become a little crisper, the light during the evening is different and how the smell in the air has changed recently. It's subtle but apparent. I know I mentioned yesterday that I'm always looking ahead but it's a challenge not to notice the coming season of fall. I'm not quite ready for fall but I am ready to change up my wardrobe. My color palette usually becomes darker (as it does for most people) and this outfit makes me think of that transition. I spent the day yesterday in muggier parts of the Bay Area and so I thoroughly enjoyed coming back to SF where it was cooler in temperatures and foggy. You look fantastic, your pants are to die for! It's like those are made for you, aw, I love it ! I'm loving this pants. 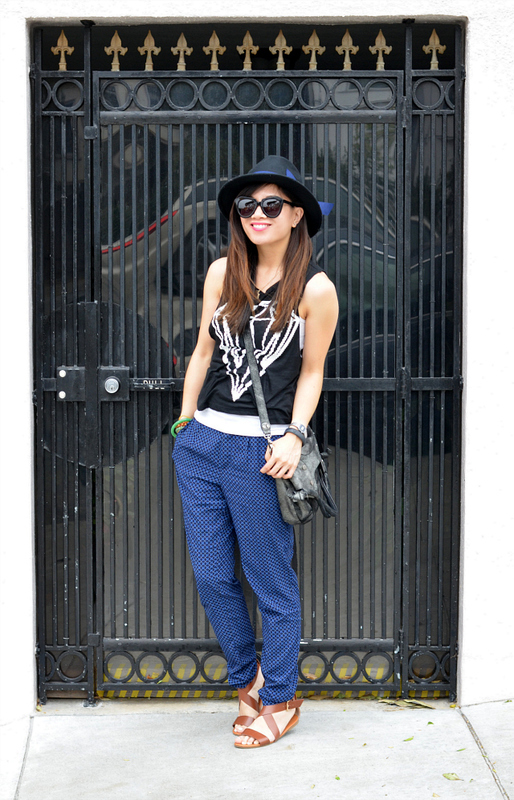 This is a great look as we transition into the Fall, and that hat is the perfect accessory. I love this outfit - the trousers and top are so pretty! not only do u look frickin adorable, but also super cozy! I've totally noticed it here too . . . except it's still 100 from about 11-6 every day. I love your trousers! Love your pants! Man, do they look comfy! I agree that it's gotten colder lately. While it's still in the 80s in NY it's not really hot because it's breezy. I love it! Yup, it is slowly but surely becoming fall! I love this outfit, so cool but relaxed! 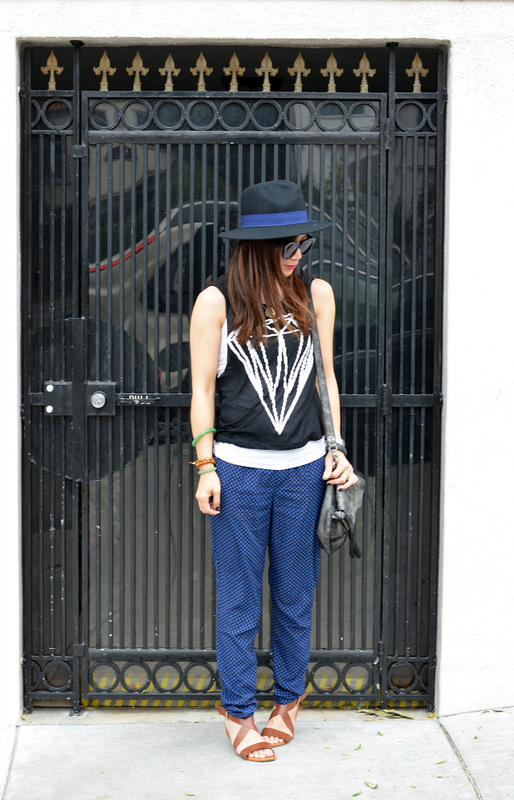 I love this outfit, especially your blue pants! Ahhh love your pants! They look so comfy and cute! Great smile in all your photos! Love the Diamond Tee it reminds me of the logo for the singer Diamond Rings. These pants look all kinds of comfy!! The pattern on them is lovely too, perfect with that top. It's starting to feel cooler here, I'm not ready for summer to end!! Those pants are so pretty! Such a great,comfy look! those pants! eep! they're the perfect combination of print and slouchy! You have the best hat collection! We haven't really had much of super hot weather in SoCal which I am kind of bummed about since I am not done wearing all my summer clothes yet. You look so easy breezy beautiful! 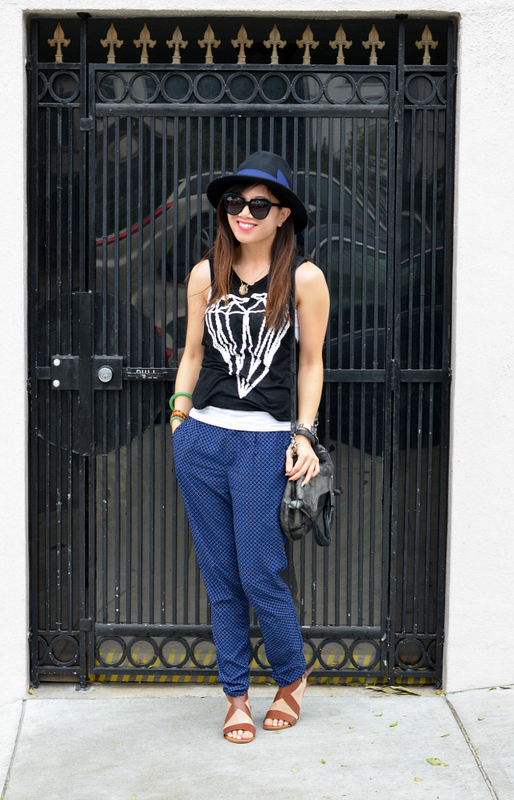 LOVING those relaxed pants! I love your hat!! You look gorgeous! I do miss the fall, the crisp air. They say summer is over in the UAE but yesterday we had 47 degrees Celsius so it is far from over! Thanks for visiting our blog! I love this outfit, very chic and comfy too. What a great outfit. 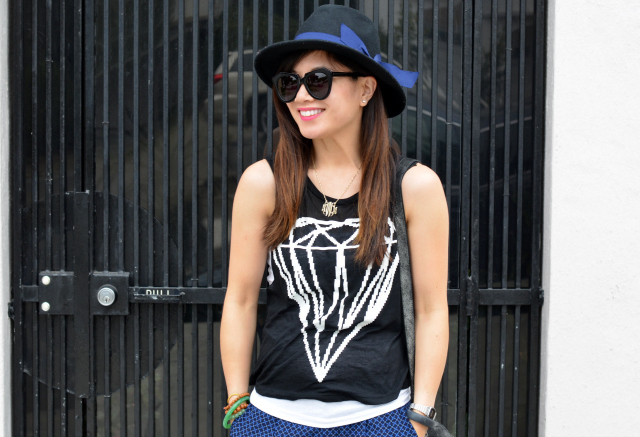 Love the navy and black combination and the diamond tee is so much fun! oooh love your hat nancy!